In the Amelia plugin it is possible to configure general working hours for the whole company in the Working hours & Days off setting on the Settings page but you can also set different working hours and services schedule, add Days off and Special Days for each employee. Work Hours – This is where you set custom working hours and breaks for any employee if that employee has different working hours and breaks from those you’ve set in the company global settings. You can choose different working hours and breaks for any day, but if you want to set the same schedule for the entire week, simply set it for Monday and click on the Apply to All Days button and the Monday schedule will be copied to the other days. 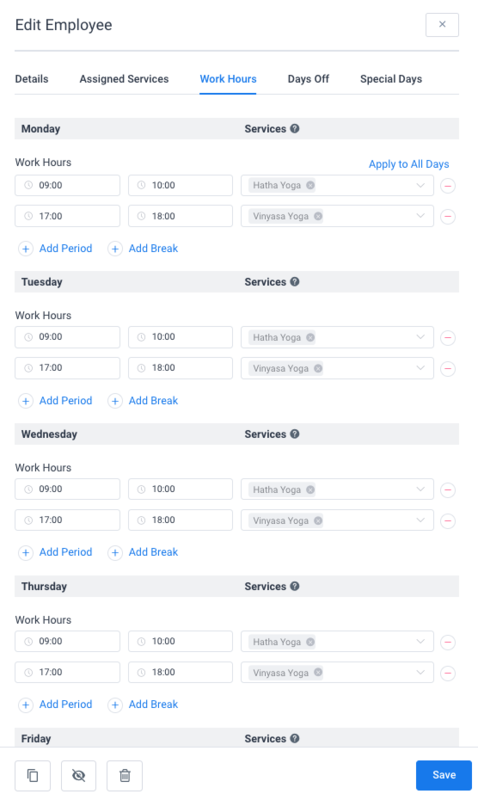 From version 1.4 it is possible to add multiple periods during the day and set a different set of services for each period so you can configure more flexible service schedule for your employees. On the right side of each period, you will see an option for selecting the services. You can select one, two or all services and those services will be provided by your employee just in that period. So, for example, you can set Cardio training from 10pm to 12pm, and a Yoga class from 7pm to 8pm. To see a different availability on the front-end that doesn’t match your settings – If you experience this please check whether you have set your Timezone in the WordPress General Settings and whether you have enabled Show booking slots in a client time zone in General Settings. To see all dates in the calendar as unavailable – This can happen if you set service duration longer then your periods in working hours are, so the service cannot fit in the schedule. Days Off – As is the case with working hours and breaks you can set custom days off for every employee. Click on the Add Day Off button and you’ll see several new options. Enter a day off name, a date or range of dates and check if you want this day off to repeat yearly. 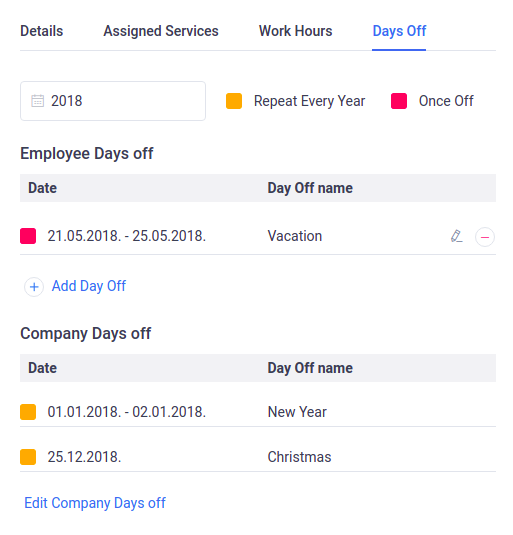 After you click Add Day Off, your Day Off will be saved, and depending on whether it is a repeating one or a one-time day off it will be colored in orange or red on the list. 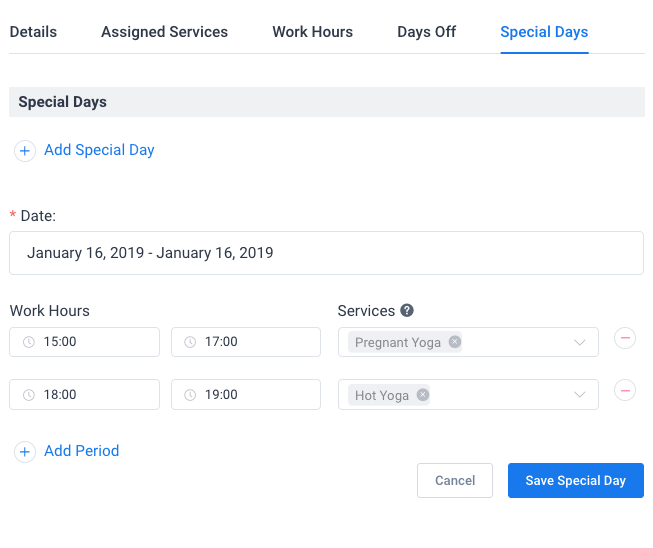 Special Days – This feature allows you to set one or multiple days in which your employee will have different working hours and/or provide different services. Whether you need to set shorter or longer working hours for just one day or a period, or set a different service for one specific day or a whole week, here you can do all of this. Once you set it, it will override employee’s general working hours and service schedule but it will not override the days off. Click on the “Add Special Day” button and new options will appear. In Date option choose a date or a range of dates, then set one or multiple periods of time with working hours and choose one or multiple services for each of them in the Service option. After you configure the special schedule, click on the “Save Special Day” button and this schedule will be applied. If you have services that are only provided from time to time (not on a daily or a weekly basis), this feature is for made you. You can simply delete the working hours and just use the special days, and the calendar on the front-end will show the first available appointment slot. This is useful especially for services that happen from time to time. The customers won’t need to search for a date. Instead, the month with the available date will be shown right away. Please note: employees can also edit their information, schedule, days off and special days. For each of this action, you have an option in the Roles Settings so you can choose what they will be able to do. Of course, before that, you need to add Amelia Employee user role to each of them so they can log in and access their profile. Once you’ve set it all, click on the “Save” button and your schedule will be applied for the employee.